Looking to open your business to the online world? SEO is the way to do it. With 93% of online experiences beginning on a search engine, getting your website and its content on the first page for your keywords will get your business noticed by your dream customers. By making yourself visible to your prospective client that is searching for things related to you, you are advertising your business without having to shout out about yourself. No one likes cold callers, right? Some of you may already have a bit of knowledge of link building, but for the most of you, you’re looking for 5* information that’ll put you on the right path. What’s certain is that taking the time to create and carry out a link building strategy is the best way to zoom ahead of your competitors in the search results. In this blog post we are going to explain what ‘link building’ is, how it will help you reach out to your target audience and most importantly – tell you all about the best link building strategies that’ll get you seen and get people talking about you. First, let’s discuss why you need to build links to your website. Direct people onto your website straight from the link on the other website. Improve your Domain Authority – in non-technical terms, the more quality Domain Authority websites that link to your site, Google will improve your Domain Authority and get you seen in the search results of your chosen keywords. The anchor text (one of your chosen keywords) that is hyperlinked on the website linking to your site will give Google an indication of the topic/industry of your site and in return, improve your rankings for that keyword and increase your chances of getting those all-important page 1 results. You can build links by simply pointing to your URL for example, www.purelysocialmedia.com. By building links this way, you’ll be working towards improving your overall domain authority which’ll increase all of your other web page authority. If you’re a digital marketing company like ourselves, we may expect our target audience to be searching for the following topics: ‘how to set up a Facebook page’, ‘how to gain followers on twitter’ or ‘how to build links to my website’. Now – think of things your ideal client will be searching, these are things that you can explain in a blog post, type these ideas and scroll to the list of search terms. Here you will find the most related search term to what you’ve type in and a list of similar searches or in tech speak – ‘long tail keywords’. Pick one of these terms. This will be the keyword you will be looking to build links to from other blogs/websites. Before you start building links to this keyword, you will need to write a blog post about it and use the keyword in your title, URL and repeat they keyword within your blog post content. Once your blog is published you will have a URL on your website that you can point to from blogs/websites. NOTE: If you’ve not yet optimized your website with your chosen keywords then take a read of our Beginner’s Guide to SEO. In this blog post you will find out our SEO tips and where your keywords need to appear on your web pages in order to get your website optimized! Build links, raise your online profile and direct your target audience to your website by submitting helpful + engaging blog posts to blogs and websites with a better domain authority than yourself. You can find out more about the benefits of guest blogging in our recent blog post. If you own a product based business, restaurant or bar, contacting a blogger to talk about your business in a review piece is a great way of getting a link. Most bloggers will take the free product, meal or drinks as remuneration for their post. However, more popular blogs and websites may charge a fee for doing this. Sponsored posts are another way of building links to your website. Most bloggers will either charge a fee for these posts or ask whether you have a budget in mind. To work out your budget or to explore whether their fee is worth it you can request to see their media kit (a document which states their total page views and social media following) and check out their domain authority by analyzing their URL on the backlink explorer on Moz. You can build links to your website by listing your details and URL to business directory websites. But – you may need to pay a small fee to list your website on online business directories. Create Great Content and Share, Share Share! 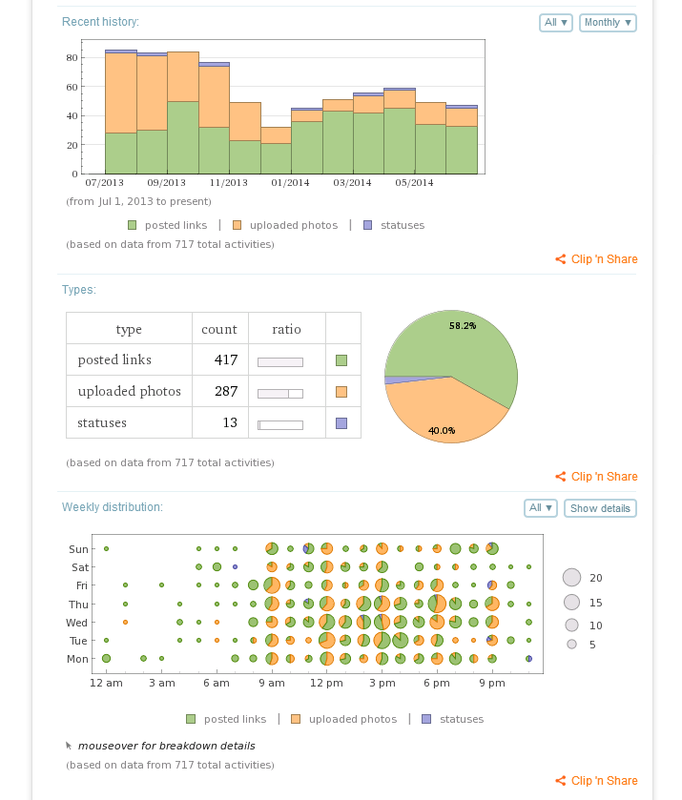 What’s more rewarding than seeing your blog posts liked and shared? As well as feeling great for writing amazing content – people linking to your content on their websites will direct traffic to your website as well as being beneficial for your SEO too! Like gaining a ‘link’ naturally through submitting guest posts, people linking to your content on their websites and sites reviewing your business – you can get a link by paying for an advertisement on a website. Although there’s the drawback of having to pay for the advertisement & only having the link for a short amount of time – paying to advertise on a website gives you the ability to get your business linked on a site with a high domain authority. And, once Google sees a high domain authority site linking to you – Google will give your authority a boost in return! Built a great relationship with your client? If they don’t know much about the benefits of SEO for their business, give them a run down about how link building improve their visibility on search engines and ask whether they will be interested in linking to your website in exchange for a link to their website from a page on your site. What’s there to lose? Is Your Website Optimized to Appear in Search Engine Results? Using the Keyword Planner Tool on Google Adwords is the key to identifying the keywords you should be optimizing for your business. Once you have found keywords, it will help you get your ideal customer onto your website. Adding your keywords to your meta data will ensure Google ranks your website in your target customers’ search results. If you’re a WordPress user, download the Yoast SEO plugin – it makes the process so much easier! Once installed, go onto the editing page of every page you need to update, scroll down and you’ll find the Yoast SEO text box where you can easily edit the title & meta description for each page. As well as adding keywords into your written content, include your keywords into the ‘Alt Tag’ on every image you upload. Google increases the ranking of websites will higher site speeds. Use Google’s PageSpeed Tool to analyze your website’s performance. If your PageSpeed is low – Google will suggest changes to improve the speed of your website. Do You Blog for Your Business? Blogging is one of the best ways to get your target audience on to your website. When you begin brainstorming your future content, your audience is your top priority. Think: what would help my audience? What search terms will be audience be using? What’s my target audience interested in? For example, if you offer hypnobirthing classes to help women have calm births, your ideal target audience will be searching for calming ways to ease labour. As your business is the answer to that search query – a good starting point for blog posts will be blog posts based on tips to ease labour, breathing exercises, pregnancy tips and motivational birth stories. Creating images that uses the same font and brand’s colour scheme to publish with your tweets and status updates. Using your colour scheme and fonts in your Instagram profile. Gain a steady growth in your social media following by publishing content regularly onto your channels. The more people who engage with your brand, the more traffic will be directed to your website. Reach out to your target audience by sharing your blog posts, relevant articles, news in your industry and useful written, visual + video content. Even though you’ll be posting other people content – you will be connect with your potential customers and making relationships with people in your industry that may share your content with their audience. Building a community around your business is a catalyst for getting your business mentioned and shared online. Delve into the world of social media networking by finding Twitter Chats, Facebook Groups and online forums dedicated to your industry. For example, if you’re an organic skincare brand, you could share your knowledge and connect with your target audience in green beauty twitter chats, Facebook groups and online forums. 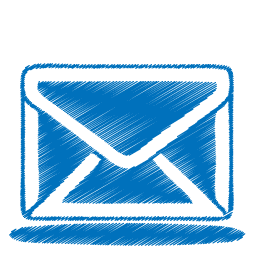 Your Email Marketing Campaign – Do You Have One? I’m sure you’ve landed on a website that either has a pop-up or side bar content offering a free eBook, course or guide in exchange for your email address? If you’re looking to connect with your audience, show your expertise and build your mailing list – this really works. Start by brainstorming ways you can help your target audience. Your email doesn’t need to be fairly complicated at first. You could send out a simple but engaging round-up email of all of the content you’ve posted throughout the week, over the last 2 weeks or month. This way you’ll direct traffic to your website and stay in the mind of your audience by appearing in their inbox regularly! The higher your domain authority, the higher you’ll appear in search results. A great way of building your domain authority is by guest blogging. By posting helpful content on websites you’ll engage with a new audience and direct traffic to your website and create that all important, domain authority boosting back-link back to your site. Start by finding websites are leaders in your industry or post similar content to your website and contact them to see whether you can guest blog on their websites. You can also find websites that are seeking guest bloggers on Twitter, forums and Facebook Groups. Instead of writing new blog posts – you can direct more traffic to your website by updating old content. If you have been blogging for a while, you may have a lot of blog posts that could benefit from being improved. Start by looking at your Google Analytics to identify old content that’s popular with your audience. 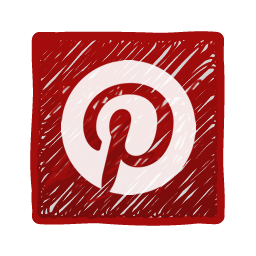 Pinterest is a huge driver of traffic. Make your feature image ‘pinnable’ by making sure the images matches your brand and creating a vertical image for each post. Google likes to see inbound links in your content. Got a blog post that’s focussed on a similar topic? As well as pleasing Google, linking relatable blog posts will help keep the reader on your website. Your old blog post could benefit from improving its title to include a keyword or to attract more readers onto your blog post. Do you mention keywords in your blog post? If not – add them naturally within the content of the post. Could your blog post benefit from offering a worksheet? Or a more detailed guide? Creating a content upgrade will offer value to your readers, show off your expertise and help build your mailing list. Hey guys! It’s been a while. We’ve been super busy trying to build our brand and tending to our clients. But we’re back and coming at you with more posts on a more regular basis. We’ve decided to work with freelance bloggers to help diversify the information that we bring to you, as well as stabilize our post frequency, so you have something to read from us on a very regular basis. This week’s article is written by Holly Sturgeon, a beauty and fashion blogger from the UK who has a passion for social media and loves to dig up information to bring to you guys. Welcome to the team, Holly! Hope you all enjoy! Back in the days our businesses depended on local and national advertising in Newspapers, on Radio and Television. Whilst those things are still important for spreading the word about your business, other options, (Free options at that – Thanks us later!) are now available. Social Media has pretty much dominated our lives over the past few years with more than 307 million monthly average users on Twitter alone. You might use social media for keeping track of your favourite celebs or for sharing your cute cat pictures rather than for promoting your business, but sharing your content on Twitter, Facebook and Instagram (or any other of the numerous social media platforms that are available) could actually prove to be quite fruitful. Ever scrolled through your news feed on Facebook or Twitter and seen a blogger or business letting you know all about their latest product or service? Of course you have! Well that’s because those businesses have started their own social media campaigns and began promoting themselves by using different social media strategies including the one’s we’re about to mention. Of course, the purpose of using social media is to promote your business but your business also needs to promote your social media. (hear us out!). Presuming you already have a website, ensure you put your Twitter or Facebook handles on your homepage and in your ‘contact’ page. Customers feel more secure knowing they can contact you instantly and so letting them contact you via social media for any customer issues is a great way to attract followers and of course encourages user engagement. It’s also vital to ensure that when you are sent a query or comment that you reply to each one individually and personally. Also ensure you deal with all ‘personal’ or account queries via direct message to ensure customer confidentiality. All of this will ensure that your followers will feel safe and this is likely to result in return business. In order for this to work, it is really important to ensure you keep your feed current. Using apps such as Buffer or Hootsuite, you can schedule posts to appear on your timeline at your preferred times. In terms of what content to publish, businesses should always keep things professional with a hint of humour. Retweeting controversial users or using foul language are definite no-no’s but posting up the odd cute cat picture (obsessed!) will keep your timeline current and will encourage users to engage by favouriting, liking or retweeting your status. You should also consider keeping your tweets short (under 100 characters) as shorter tweets are proven to attract 17% more engagement. Timing your updates is also important. 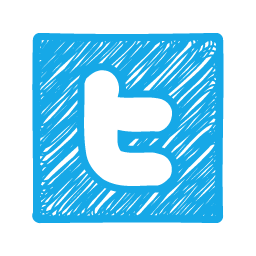 According to Social Media Scientist Dan Zarrella, Twitter engagement for brands increases by 17% at the weekend. It has also been proven that Twitter users who use their mobile phones to browse their newsfeeds are 181% to be on Twitter during their commute. Perhaps consider posting in the early morning. The same applies to Facebook and Instagram (we’ve all done it) as we are all more likely to browse through social media platforms out of boredom whilst travelling. Here we go with the cute cat pictures again – You are twice as likely to receive comments, replies, likes, retweets etc if you post an image with a link. So whether you choose to post a picture of your latest service or even a picture of the office Christmas Tree, you are encouraging people to engage with your brand. Engagement = visitors = Followers = Customers which is the aim of the game. Anyone who types “spring cleaning” into the search bar on Twitter will be able to see your tweet, this also applies to Instagram and Pinterest. Using more popular hashtags, including ‘trending’ hashtags (which you will see on the left hand side of Twitter or on the right side of Facebook) will obviously mean your tweet reaches a bigger audience, but that also means that more people use that hashtag and so your tweet will be pushed down the newsfeed very quickly, leaving a limited amount of time for users to see your status. If you use hashtags that are relevant to your status, you will reach new users that are genuinely interested in what you have to say meaning you are more likely to encourage engagement and receive more followers. If someone retweets your status, their followers will see your business name in the tweet, despite the fact that you’re not directly advertising. Clever huh? Everyone wants something for nothing. We all have entered a competition at some stage in our lives, whether it was in a magazine or even just buying a lottery ticket. Running a competition on social media can prove to be extremely popular and will definitely encourage people to follow you. Whether you offer a service or a product, running a competition on social media where the users are required to “follow and share/retweet” your status to enter will mean you will get a follower, who will share your status with their followers, who will then share it with their followers and so on. It can result in hundreds of followers and will mean more people will visit your website. Using clever hashtags (such as #win, #competition and #giveaway) for this, like previously mentioned will see your competition reaching the masses. No-one really wants to pay for something if they can achieve similar results for free but we thought we should cover all options available to your business. Of course, there are paid options available on both Facebook and Twitter where you can start a campaign which see’s the platform advertise your service on newsfeeds. You might have seen “promoted” statuses on Twitter which are paid for advertisements and the ads on the right hand side of Facebook are also paid for. Advertising this way is definitely useful for those who have a budget to work with but can also be an expensive way of experimenting with social media. Using social media can increase your customers greatly and is definitely something your business will depend on if you want to increase exposure online. Keep an eye on this blog for more tips on using social media to promote your business and feel free to submit your questions! We’ve already written an article on How NOT to Fail at Social Media Campaigns, but recent social media news have inspired an article on what to do if you do happen to fail. As with everything in life, there are situations in which no matter what amount of planning goes into something, things still go awry. You may or may not have heard about the Sleepy Hollow marketing blunder with their “Happy Headless Day” campaign. To welcome the new season of the FOX network show, Sleepy Hollow , based on the stories of the Headless Horseman from European folklore, FOX launched a “Happy Headless Day” campaign with witty puns from the show about the headless character. Unfortunately, this campaign launched the same day as the devastating news came out about Steven Sotloff’s death. Needless to say, the media took this campaign and ran with it warping the intentions of the “Happy Headless Day” campaign and putting Sleepy Hollow in a bad position. This is a perfect example of how a well-intended campaign can go awry purely due to unforeseen events. Had this campaign been launched 6 months prior, no one would have looked twice at it. However, due to the timing and the hungry media looking for a scandal, FOX network was put in a bad position. So now, the question is this: What do you do if something like this happens to you? You’ve read our article on How NOT to Fail at Social Media Campaigns, did your research and are confident that your new campaign will be a success. Out of nowhere at the very last minute, something happens that sets your plans off track and puts your brand in a bad light. Immediate damage control. First things first, you have to immediately initiate damage control. This is one of the main reasons why you have to be ever-present in your social media accounts. If you or someone you delegate is there to catch an issue as soon as it occurs, you have a better chance of minimizing the amount of damage to your brand. 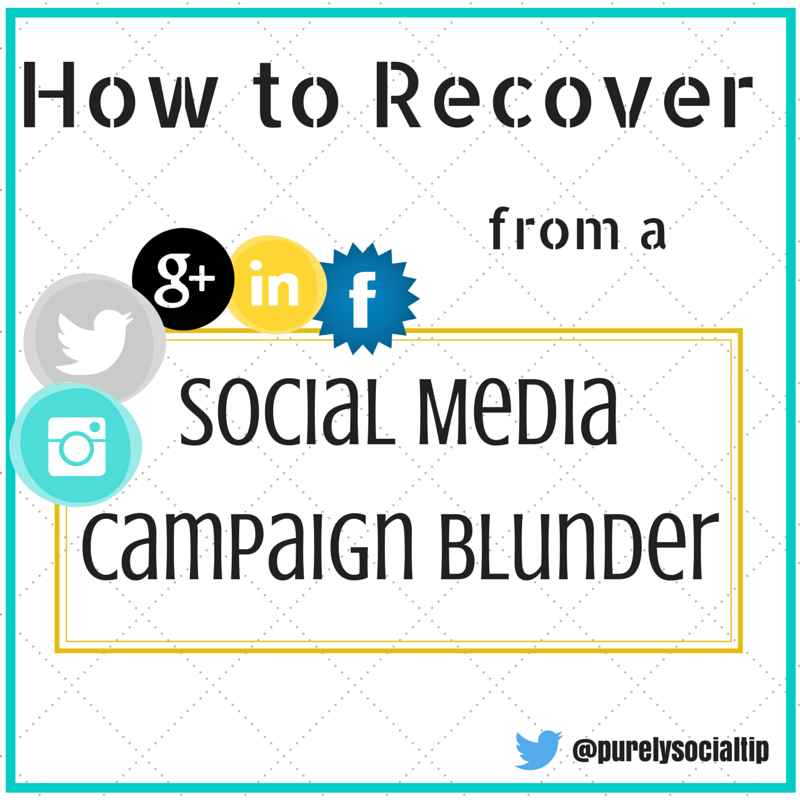 If you set a campaign up and forget it, you’re bound to miss any feedback or backlash from your campaign. This will only cause negativity to fester and spread across your entire brand. Sincere apology. Emphasis on the word “sincere.” Whether or not you think you did something wrong, you need to understand this: once you publish something, it no longer belongs to you. If your public portrays something as offensive or insensitive, it is your job to understand their point of view and empathize with them. Try to understand why your campaign would make them upset, apologize and mean it, and if necessary, retract your campaign. This doesn’t mean that you need to take down your campaign every time you upset one person, but use your discretion. If the campaign makes a turn for the worst, you have to take it down. Plan for future action. If the reason for the blunder was an oversight, it may be necessary to add an additional step in your ad campaign clearance. For example, FOX network may now require someone to check through the news before launching a campaign to ensure that a campaign they are about to launch will not be offensive to anyone. If the reason was out of your control, have a team dedicated to monitoring the campaign from beginning to end prepared to institute any damage control immediately. Unfortunately, no matter how much researching you do, there could be unforeseen events that throw your campaign off. The media will almost always find a way to warp information to fit their purposes, and trolls will do their best to make you look bad. There is hope, however, in your recovery. The worst thing you could do is ignore the problem and hope it goes away; that will only fuel the fire and allow people who are already mad at you to get even more upset and talk amongst themselves. Your presence is 100% necessary to help mediate the issue and smooth everything over the best you can. The problem will most likely not go away on its own in most cases. So, engage and speak up! Don’t forget to come talk to us, too! We’re ever-present on Twitter and you can reach us in the comments below, as well. Also, we just launched our new site: http://purelysocialmedia.com, so check it out and let us know what you think. If you need any tips or advice on your specific social media situations, feel free to send us and email! We love to chat! The expense of marketing as a whole generated 26% of Motorola sales. Advertising accounted for 55% of those sales, at only 11% of the total marketing budget! For every 10,000 yuan spent on advertising, 382 phones were sold. However the same spent on in store promotions only resulted in the sale of 96 phones. Assuming the industry average is a profit margin of 30% per phone sold, Motorola’s was more than double with every yuan spent on advertising yielding 15 yuan. You have the ability to assess your efforts in a similar way. One, that will allow you to begin to make strategic decisions. One way to do this is to export the data you have from your various social platforms into Excel files (.xls). Start with one platform at a time, be sure to save your original data, simply copy and paste the data onto a new sheet to begin your analysis. For the purposes of this post we’re going to use Facebook as the platform we’re going to export our data from. 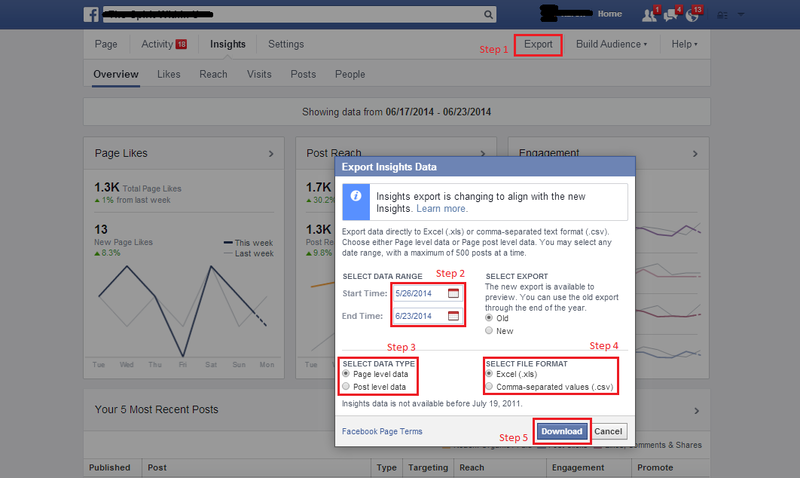 You should know that you can export data related to your Facebook Page from two places, Ads Manager, which provides reports on any paid advertising you’ve done on Facebook, or from your Page’s Insights. General Metrics: provides you with an overview of each ad, reporting reach, frequency, impressions, clicks, money spent, and actions taken. Website Conversion: provides information on all ads that we’re driven to purchase or register on the landing pages you’re required to link to your ad. Placement Based Metrics: provides information on the placement of your ad, was it seen in the news feed or the right column space and was it viewed on a mobile device or PC? Responder Demographics: provides information on the people your content reaches, providing you with their age and gender. Page Actions; provides you with insight into the actions people are taking with your ads, how many are liking, sharing, comments and engaging with your content? Video Actions: looks specifically at the videos you post, how many people viewed or clicked on a particular video, did they watch the complete video, did they share like or comment? Application Actions: looks at the application associated with your page, for example you may use this when running a contest on Facebook. 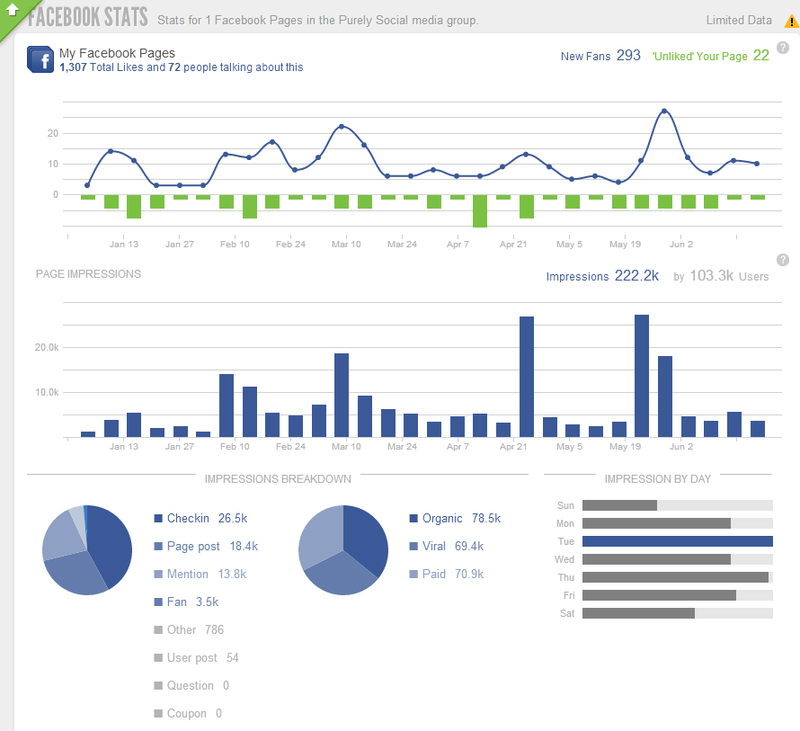 From your Business Page select Insights to generated reports related to your page and posts. Click export, this will open the Export Insights Data box. 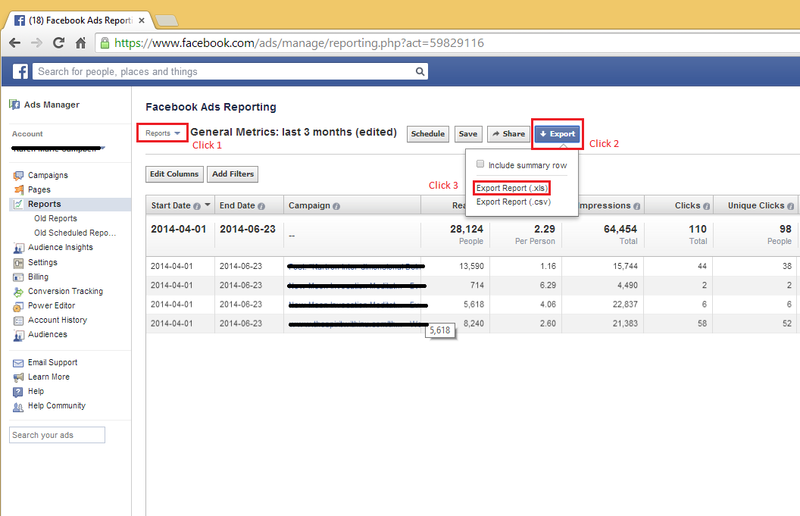 Select the dates you want the report to focus on, determine whether you want the report to be based on your page or post activity, then select the old vs. new export (doesn’t make a big difference) and click Download. Based on Chart A we can see that the posts for this account performed better in Quarter 1 than in Quarter 2. With this one piece of information you could review all of your posts from the first quarter, looking for any patterns or theme. Run another report for Quarter 1 posts and you may discover that there is a time of day that works best for your audience or you may determine that certain events or posts really attracted a lot of attention from your audience. 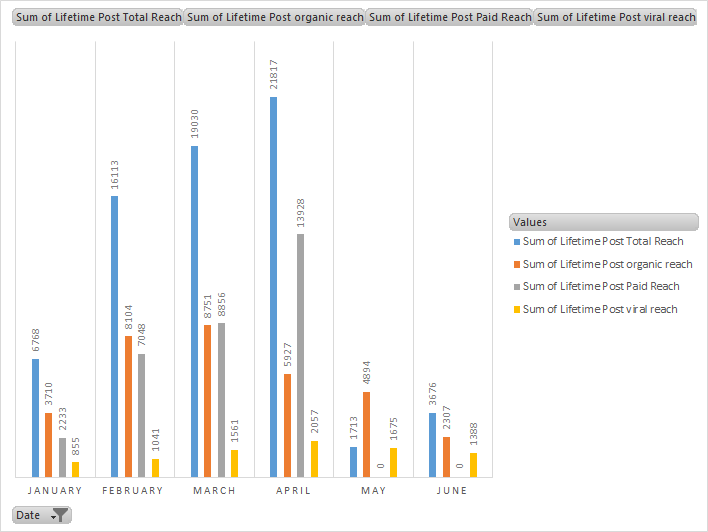 Chart B looks at the paid ads this account ran in Quarters 1 & 2. Based on the chart we can see that 2 ads did really well in relation to the cost of the ad. What we want to point out is the last ad, Website Clicks New…, and provide a little back story. That ad was part of a two week promotion for a paid live stream event. The cost of running this add was $166, that included the graphic art used in the promotion and the cost of advertising on Facebook through Power Editor. The results of this advertising we’re 7 attendees for the live in store event, 35 online attendees and resulted in this business netting $700. This resulted in about a 24% profit margin. This company was thrilled to see that a few minor changes to their Facebook advertising strategy could not only generate revenue but also drive traffic to their site and events. It just take some time and a willingness to experiment. As always we hope that you have found this post to be beneficial. Please be sure to leave us a comment below, we would love to hear from you! Last week we completed our Content Calendar series and it really got us thinking about a few things… Things about your business, how you use social media and why? Over the past few weeks we’ve been in the process of discussing our services with some new potential clients and we’re starting to notice a few things… For one, many business owners know that they should establish a Social Media presence, at least that’s what everyone keeps telling them, but they aren’t really sure what to do once they are there. So begin by asking yourself: how should my business be represented on Social Media, and how should we position ourselves to stand out from the rest? These can be tough questions to answer but are necessary to the development and execution of your strategy. Your Social Media drives traffic to your website, playing a key role in lead generation and sales conversion. 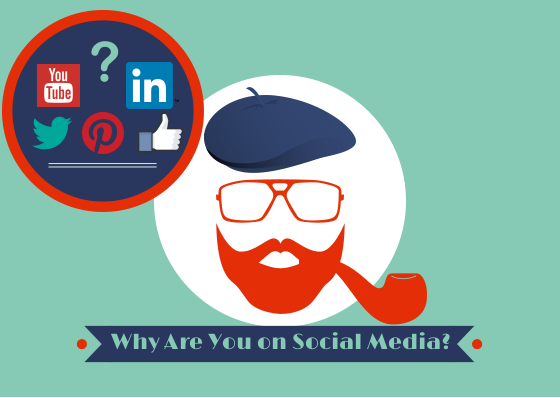 Your Social Media simply supports and beefs up your online presence. For example, there are some industries that are just ideal for social media. Fashion, beauty, physical fitness and photography work well because they are rich in visual content. Followers and fans of these industries get the behind the scenes tour for their favorite brands and personalities. Social Media is an opportunity for these brands to have fun and engage with their followers in a way that would not be possible through their websites. Unfortunately, this utilization of Social Media does not lend itself to every industry. For example what are the chances that you will be compelled to follow an accountant on Facebook, an exterminator on Instagram or the local dry cleaner on Pinterest? Pretty slim to none, right? Well truth is you just might depending on your interaction with that particular business. This is where category 2 comes into play. As we previously mentioned we have been in talks with two potential clients regarding how we can assist them in developing and sustaining a presence on Social Media, one client operates a young dental practice and the other sells various insurance packages to local businesses. Neither of these businesses would be considered glamorous in the world of Social Media Marketing and neither are rich in a steady flow on exciting visual content. Does this mean they shouldn’t be on Social Media? Of course is doesn’t! It just means we’ll need to be calculated… We explained to these clients that they will need to shift their view of the role Social Media will be playing in their businesses from category 1 to category 2. For these types of businesses we’re not looking to drive traffic from a platform to a website, but rather we are looking to create a Social Media presences that allows visitors from their websites to get a good sense of what that particular business is about. There are tons of dentist out there, so how will a patient decide between them? Well for one they’re going to ask around, read reviews and visit the offices’ website. But what will be that determining factor that helps seal the deal…. It very well might be their Social Media presence. We explained to these clients that Social Media is an opportunity for them to share with the world what makes them special and unique. Social Media is a great place to highlight their company culture, explain various policies and showcase their knowledge in a particular area. It’s also a great way for them to interact with their customers in a more relaxed setting. Everyone likes getting a birthday card in the mail, but imagine receiving a birthday wish from your Dog Groomer via twitter. You’d feel pretty special and a bit tickled for the unique interaction! There is an opportunity for every industry to utilize social media effectively , it just takes some creativity and a little trial and error. Defining what your intentions are when it comes to creating a Social Media presence will not only save you time but confusion as well. Don’t set out with the intention of doing what everyone else is doing, take the time to study the social accounts of other businesses in your industry. What are they doing well and what do you feel they could lose? Figure out what works best for you and be prepared to try many different things before settling on the strategies and tactics that are ideal for you! As always we are most interested in hearing from you! Have a comment you’d like to share, or maybe you have a question you would like answered. Leave us a message below or email us at purelysocialinfo@gmail.com. We can wait to give you the advice or help you desire!